Ninth Hour and Presanctified Liturgy - 6:00 p.m.
Η Ενάτη Ώρα και Θεία Λειτουργία Προηγιασμένων Δώρων - 6:00 μ.μ. 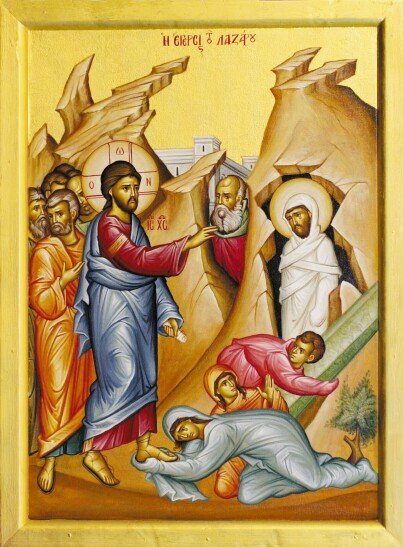 5th Sunday of Lent, Sunday Of Saint Mary of Egypt, 8:15 a.m, 9:30 a.m.
E’ Εβδομάδα Νηστειών, Αγίας Μαρίας της Αιγυπτίας, 8:15 π.μ., 9:30 π.μ. Our 4th Annual Philoptochos Society Walk-a-Thon. Walk with us or sponsor a walker! Anemos Hellenic Folkdance May 2019 Celebrations! Fr. Peter was born in Chicago to Vasiliki and John Sarolas and grew up at St. Basil’s Greek Orthodox Church parish. With the Blessings of His Eminence Metropolitan IAKOVOS of blessed memory, he entered Hellenic College in Brookline, MA in the fall of 1987 where he received a Bachelor of Arts degree in 1991. He then entered Holy Cross Seminary where he received a Masters of Divinity in 1994. Fr. Peter married Maria Karantonis, also of Chicago, in November 2005. They have three sons, Yanni born in 2007, Vasili born in 2009, and Stefanos born in 2015. Fr. Peter was ordained to the Diaconate by His Eminence Metropolitan IAKOVOS of blessed memory on January 1, 2007, the Feast Day of St. Basil and was ordained to the Holy Priesthood in May of 2007. He served as the associate pastor of St. Demetrios church in Chicago from May of 2007 to February of 2014 and the community of Ss. Constantine and Helen, in Rockford, Illinois from February 2014 until December 31 of 2018. On January 1, 2019 Fr. Peter was assigned by the Metropolis of Chicago to our parish. We welcome Fr. Peter, Presvytera Maria, Yanni, Vasili, and Stefanos to St. George Greek Orthodox Church. Congratulations to our newly elected Parish Council for 2019!